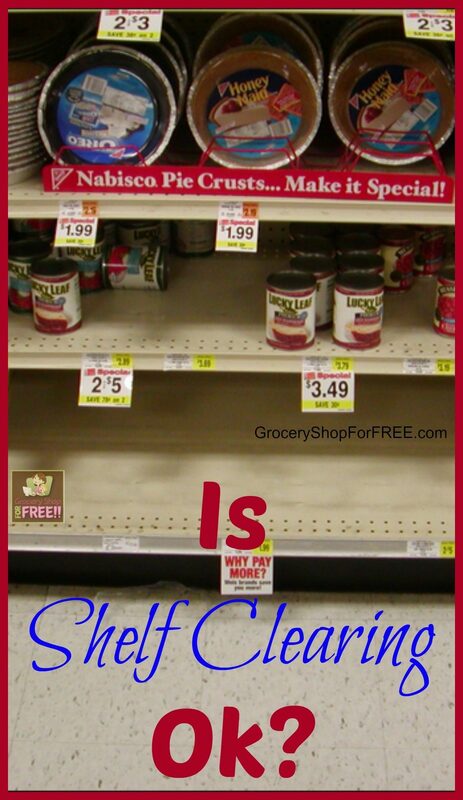 You are here: Home / Finance / Couponing / FAQ About Coupons: Is Shelf Clearing Ok? Many times I have been asked the question “Is Shelf Clearing Ok?“. For those of you who aren’t familiar with the term “Shelf Clearing” – it means when there is a good deal on an item and someone goes to the store and takes all of the item and leaves none for anyone else. Now, is a shelf clearer someone who takes the last three on the shelf? Opinions vary, I suppose. I don’t think taking the last three is shelf clearing. Taking forty and leaving none or four may be. Have I done it? Probably, in the past. Do I do it now? No, I don’t need as many as I used to with three of my four kids no longer living at home. But, is it wrong? If there are no limits set by the store or on the coupon… no. Plain and simple. So, the answer to the question, in my opinion, is yes it’s ok, if no limits have been set … but is it considerate or selfish? Have you had any run-ins or issues with shelf clearers? Or are you a proud shelf clearer? 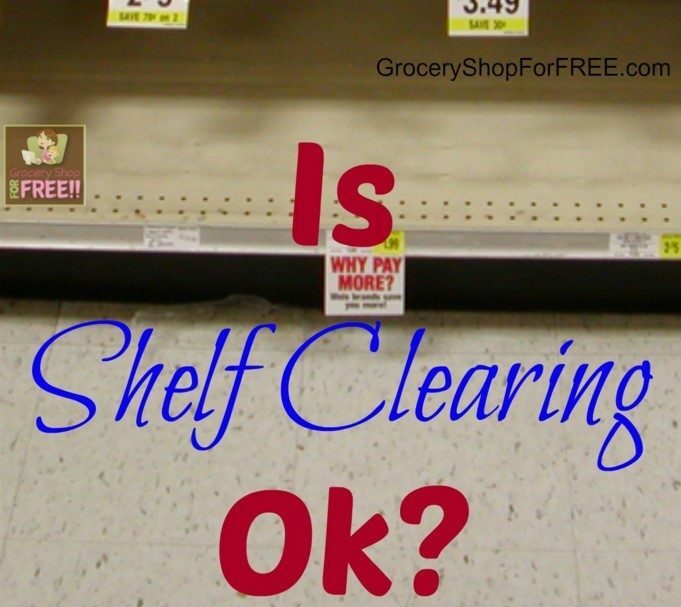 What exactly do you consider “shelf clearing”? FAQ About Coupons: Does Walmart Take Competitor’s Coupons? shelf clearing is rude, I am sorry but where is the consideration for other ppl? but unless you see someone actually doing it,what can you do (what can you do if you do see someone doing it?) I have definitely gotten to a store seen there is just one or two left and grab them both, but I have never cleared a shelf or took like 10 of one thing- the most I ever did was buy 10 boxes of pasta at once but there were a ton of them,and I didnt take all of the same kind either!! !In all honesty if I seen someone doing it, I am the type to not keep my mouth shut- I would definitely say something but thats who I am! I agree it is really rude and she said you should have beat her to the stores. Some folks work , some work two jobs, some take care of sick and littles and older folks too so it can be difficult to get out. She may find some day that God strikes her coupon stash with that fire she was talking about. I mean the kid that asked for the power type bar and she didn’t turn and at least hand him one are you kidding me! In fact I think that is what he said. Thing is most of that stuff goes off after a short while so unless you donate a ton of it. YOUR just being greedy , rude and obnoxious! I take what I need for my family of 9 for 10 days and I have never cleared a shelf. You say it’s rude, but what do you know about the person doing it? do you know if they use coupons and “clear racks” because that’s their way to donate as much to kitchen soups for homeless people or give all those wipes to mothers in halfway houses with children running away from abusive partners? If it were for that, I’m sure you would give the person a standing ovation. And THAT is the problem you have my friend. Why do you care of the WHY or even the WHO? What if it was just 20 buyers taking 5 each that finished up the store stock on the sale item before you got there? THEN you wouldn’t be upset either, right? Mind you, here’s the best part. If it were someone just buying them all with no coupons, I bet NO ONE would care. Why is the “couponer” the bad guy? Because they use manufacturer discounts or store discounts through coupons? So long as the coupons are legit, the store will be paid the value of the coupon PLUS shipping, so no one loses there. The manufacturer makes their profit, the store makes their profit. RUDE and self centered PERIOD. Those food/supplies hoarders are no better than animal hoarders, they simply justify they hoard with their family. While I do think it’s completely rude and inconsiderate and do not condone it, you have to think that people who clear shelves are more than likely addicted to coupons, and what does any addict do…. whatever it takes to satisfy that addiction. So, like any other addict, they don’t consider the feelings of others and how her habits/addiction will affect others. Ew. So inconsiderate. I think the limit should be 4 like items because a lot of coupons are for two items. Any more than that without at least attempting to try to order more from the stores (who usually restock mid-week around here) is obnoxious and rude. It’s people like her that are making stores have to limit EVERYONE to four items. And does she have to be so proud of herself? Early bird gets the worm? Personally, if someone had walked up to me at the store and I had more than I needed and the shelf was empty, I would have gladly handed over the item WITH a coupon. It has gotten to the point with the Extreme Couponing craze here that I end up spending probably twice as much in gas to drive out of my way to other locations, because my local grocery stores less than 5 minutes from my house are FULL of bare shelves! I don’t even clip coupons anymore 🙁 So sad a few have to ruin it for the rest of us! RUDE!! We have 5 local Walgreens, one week they had a great deal on Keri lotion. This lotion was the ONLY lotion that did not react negatively to my dying grandmother. I went to ALL 5 and could not even get ONE bottle for my grandmother! Shame on ALL those who do this and SHAME on TLC for this show! For those of us just trying to feed a family or trying to help out others it has been a nightmare! I think it’s a sad commentary that a store would have to have a policy regarding limits. I’m sad we even have to ask this question. It’s rude, inconsiderate, unkind, selfish, obnoxious, and mean. If I went to the Thesaurus, I am certain I would find more words to describe my disdain for these people. This was one of the reasons why I was glad that P&G instituted their own policy that you cannot use more than 4 “like” coupons in a transaction. Regarding more than one transaction at a time, if there’s no one behind you, fine. If not, I repeat all the words I said above. It’s rude. Inconsiderate. Selfish. Greedy. Piggy. Obnoxious…and lots of other words I don’t care to put into print. The fact that these extreme couponers brag about this is upsetting. It is what gives regular couponers a bad name and what has probably contributed to all sorts of new rules and limits set by stores and manufacturers. Since when is it anyone’s “right” to basically make it impossible for other folks to also save some money? I mean the idea that “the race belongs to the swift” or “the early bird gets the worm” just does not hold here, folks. Mature adults, even the neediest among us, do not take everything just because they can. That is disgusting. It reminds me of people who go to buffets and bring containers to take food home (seriously!) and think that is OK. Only management stopping them WILL make them stop. Stores should enforce reasonable limits. Even allowing shoppers to pre-order big amounts seems just plain wrong. As for clearing the shelf, it is relative to how much is actually stocked. In our local CVS, they don’t stock more than a half-dozen of almost anything (space issue), so anything more than 2 is shelf clearing. In stores where there are dozens of products, maybe you can take a half dozen. Real shelf clearing is when there is lots of merchandise and somebody literally takes EVERYTHING that is there. People know when they are shelf clearing. THey just pretend it is their right. Here’s a guideline I would tell someone: If you would not pay full price for the same number of items, then put them back. Greed Greed Greed. It is sickening. GAHHHHH!!! I wanted to reach through the screen and slap that woman! I am not a mean person; I don’t go around slapping people, but, dang, she got me fired up!!!! I wish ALL stores would put limits on how many products a person can buy at one time. I think ten items per person is reasonable. Oh, and don’t forget that EXTREME COUPONING is a reality show. When the guy walks up and says: “Is that the last one?”or something like that, it was staged to get the point across. But I have been that person; I got to the store one mili-second too late only to find that the person whose cartS were bulging at the seams had cleared 99% of everything I needed. I wish that show would go off the air; it is only hurting us couponers who only get what we need for that cycle until the next sale comes along, and we know they do. I agree with the lady who said God just may burn that ladies coupons if she’s not careful. And Stacey, I don’t know how you didn’t go all JACKIE CHAN on that woman! That was just uncalled for and the police should have been called. Or at least report the incident to the mgr in hopes of keeping the lady banned from the store. I work for a coupon web site, and teach “how to use coupons classes”; one thing I can’t emphasize enough is to not be a shelf clearer, to leave items for others who REALLY need them because they are in dire straits. Not so happy in Woodstock, GA. I personally agree with many of the others. Shelf clearing is rude and unnecessary. I’ll give a couple of examples. One, Kroger about 6 weeks ago, had Angel Soft Toilet paper 10/$10. The coupon was $0.45/1 and doubled at the Bowling Green store making it $0.10 before tax. Of course, I only wanted 2 since I keep up with all the deals I can and keep a good stock pile. It goes on sale too often to buy a store out in my area. But I found out the reason they were out was because of one lady who was proudly selling them on Craigslist for $1 a pack. They were also out of Carefree, Colgate toothpaste, and a few other items in which she also was proudly selling. “Let me do the couponing for you,” was her logo. That, to me, is outright wrong and rude. A second example, 3-4 years ago, there was an amazing deal on Purex at Rite Aid before they changed their BOGO policy. Honestly, I think this was the deal that caused the change. My friend who is a manager at our local store said a lady came in with dozens of BOGO Purex coupons and cleared out the 40 they had in stock. This was Sunday, the first day of the sale. If that wasn’t enough, she went back on Tuesday and Friday later that week when they got in the other trucks and bought all of those out, too. I just wanted 4. Plain and simple. I shelf cleared one time (5 years ago when I was just starting out) on an item I needed 6 of to do a deal, and that was all the store had. My husband used them all the time, so I was excited! Later that week, I heard a lady at church who really needed the product(who could hardly walk) and hoped to do the deal and couldn’t because it was bought out. I never did it again because I realize how rude and cruel it was for those who really needed the product (Tylenol Pain Relief Patches). I brought some to her later on and shared my stock pile. Nope, I am against shelf clearing. Period. If people need that product more than I do, I will rework a deal. Plain and simple! Those are great examples! I know a lot of say we are also shopping to donate things, and that’s great, too, but, as you pointed out there are people all around us that need the deals as well. Well said! What Ali said is dead on though. They are exactly what’s wrong with this world today. No consideration for anyone else, and a one way ticket to “the land of the oblivious” where no one exists but themselves. That’s right – it’s so sad! Rude? Seriously? There are at least 8 grocery stores within 15 mins of my house. Somebody took it all? Cry about it and go to a different store. Oh well. Every time I get formula I clear the shelf. I get as many as they have. I have to grocery shop for at least month worth of food at a time BECAUSE I work two jobs and get maybe one day off a week. So, yea, especially with non perishables, you’re *&$# right I clear the shelf. Especially if its .50 cents or less. I coupon only to get enough to have a few things on hand for my family. I have seen people clear a shelf in front of me. Incidentally I saw the same person at the swap meet the next week reselling all of the things they took. Meanwhile I couldn’t get even one for my family of 3. Shelf clearers are the worst. Just because theres nothing left on the shelf doesn’t mean 1 person came and took it all. If you see 1 person take it or see them in the store with a basketfull of the same item with nothing left then that’s shelf clearing. If I come in and only 3 are left and I take them all that is not shelf clearing. This is insane. I would steal it from her cart. i have encountered a local shelf clearer on several occasions. Her and her husband coupon household/grocery items at local stores then they resell them at a flea market in town at a higher price. I said, ahhh you guys are the reason i can’t use my coupons on these items…lol! she said, you should have gotten there before me. Not only is this completely wrong in my opinion….they are rude on top of it all. There was no hoarding about it. They took a product that anyone could have gotten for a fair price…..or free and took them all to make a profit off of them in the same community. i refuse to buy anything from those people and i tell everyone else what they do. Its stupid to pay them more for something everyone should be able to get from the store the same way. i’ll pay full price to the store before i will pay them for anything. attitude meant more than the shelf clearing even. No need to be ugly to people just because they caught on to your game. That sounds like a very unpleasant experience. I don’t think there was any need for them to be rude to you. There are many people who do this and then sell their stockpiles. I guess they are thinking if they got it FREE and they are selling it back to the community for less than what the store’s are, then some people can benefit. Either way there’s no no need, like I said, for them to be rude to you. I am very new to coupons so please be patient. Especially with stores like Walgreens they NEVER have enough product for their sale or coupon items unless it’s candy. Many other stores have plenty, but unless someone is working on their own stockpile, clearing a shelf with more than ten items seems to be selfish. If we ask for a raincheck, and the store is reliable on getting the product, can we still use a coupon when the product comes in? Here in Washington we can’t double our coupons so I am learning how to stack, utilize rebate apps, and other skills or tricks. It can be a bit confusing but I have learned a lot in the past couple weeks!! Any tips would be greatly appreciated! Welcome! CVS and Walgreens are notorious for having just a few of the things that are awesome deals. “The early bird” definitely gets the worm at those stores. If the coupon has not expired yes, you can use the coupon when you redeem you raincheck. Sometimes it’s just easier to do that. Many of the stores actually run both ads after about 6:30 pm on Saturday night, so, if you have a store that allows you to do that – that may be why the items are gone on Sunday.